The afternoon session starts at 13:00. 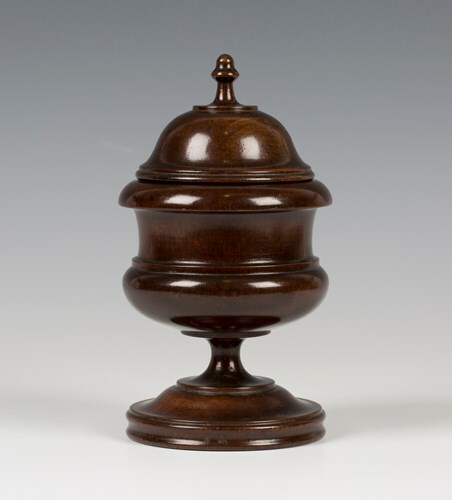 An 18th/19th century English pole lathe turned mahogany jar and cover, the domed lid with knop finial, the shaped body on a turned stem and circular foot, height 21.5cm, diameter 11cm. 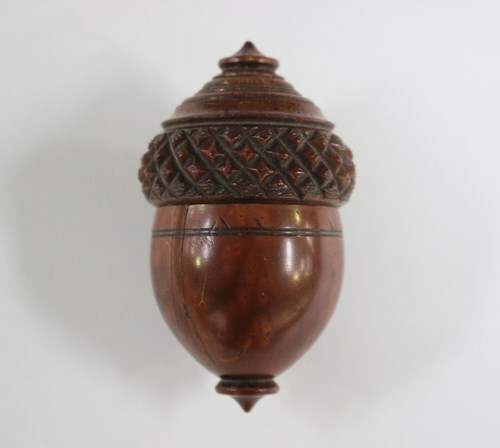 Provenance: Toovey's, The Polly de Courcy-Ireland Treen Collection, 20th September 2006, Lot 607. 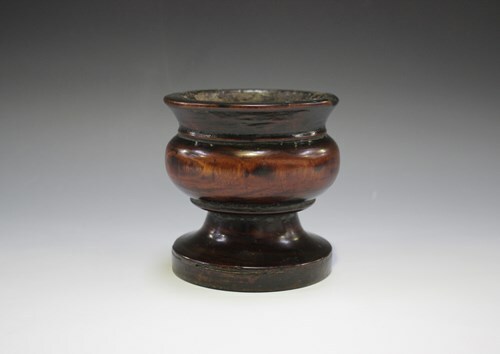 An 18th century English lignum vitae master salt, the tapering bowl with reeded rim, on a waisted socle and ring turned base, height 12cm, diameter 13cm. Provenance: Toovey's, The Polly de Courcy-Ireland Treen Collection, 20th September 2006, Lot 567. 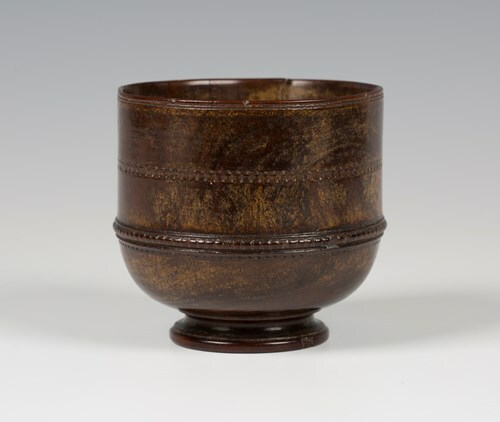 A late 17th century English pole lathe turned lignum vitae footed spice bowl, the finely drawn bowl with ring turned, gadrooned and incised bands, the stepped circular foot with a screw thread to underside, height 10cm, diameter 11cm. Provenance: Toovey's, The Polly de Courcy-Ireland Treen Collection, 20th September 2006, Lot 503. 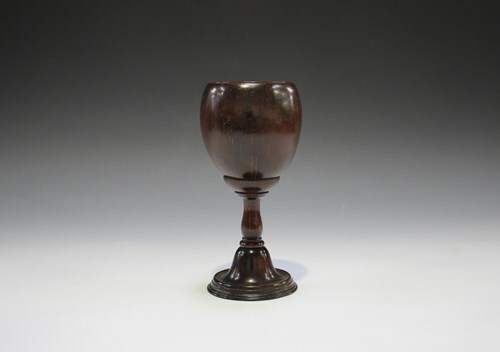 A 19th century coconut bowled goblet, the turned beech stem on a stepped mahogany circular foot, height 16cm. Provenance: Toovey's, The Polly de Courcy-Ireland Treen Collection, 20th September 2006, Lot 513. 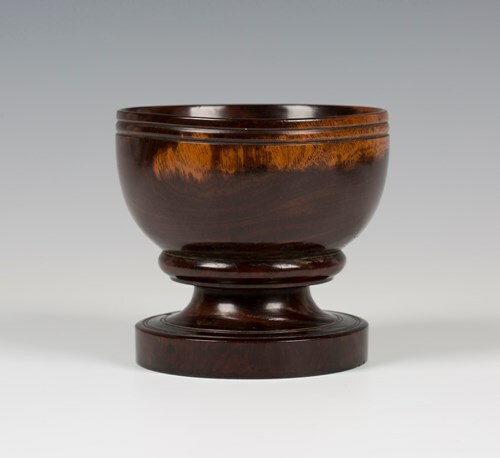 An 18th century English pole lathe turned yew covered bowl, the domed cover with a dished centre and later knop handle, the sides with ring turnings, height 10cm, diameter 13cm. Provenance: Toovey's, The Polly de Courcy-Ireland Treen Collection, 20th September 2006, Lot 601. 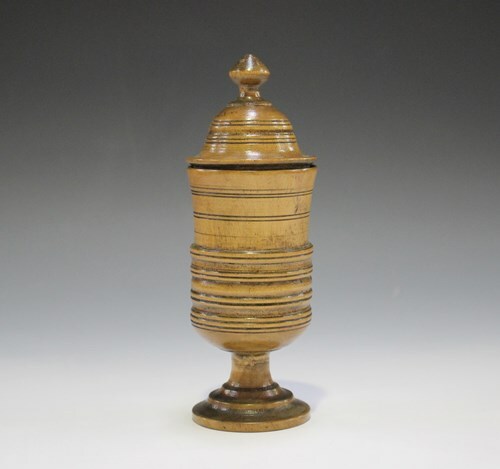 A late 18th century English pole lathe turned fruitwood tea caddy or spice jar, the removable lid above an ovoid body, height 13cm. Provenance: Toovey's, The Polly de Courcy-Ireland Treen Collection, 20th September 2006, Lot 603. Note: a similar example is illustrated in 'Treen and Other Wooden Bygones' by Edward H. Pinto, plate 315D. 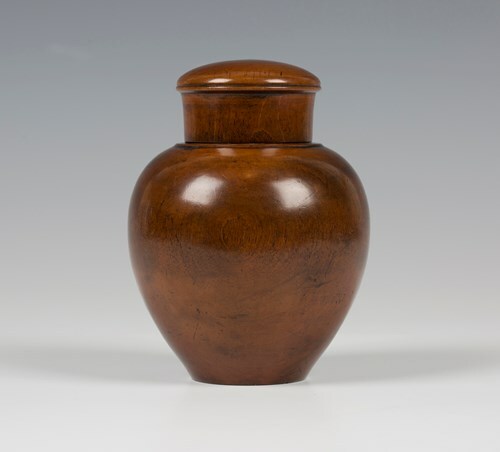 A late 17th/18th century English turned fruitwood vessel, possibly a master salt, the bold lip above a bulbous body and a stepped foot, height 12cm. Provenance: Toovey's, The Polly de Courcy-Ireland Treen Collection, 20th September 2006, Lot 569. 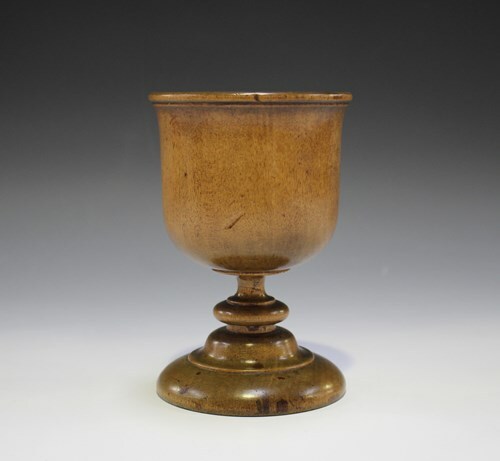 An 18th century English pole lathe turned beech drinking goblet, the globular body with an everted lip and a ring turned stem, raised on a stepped foot, height 14cm. Provenance: Toovey's, The Polly de Courcy-Ireland Treen Collection, 20th September 2006, Lot 517. 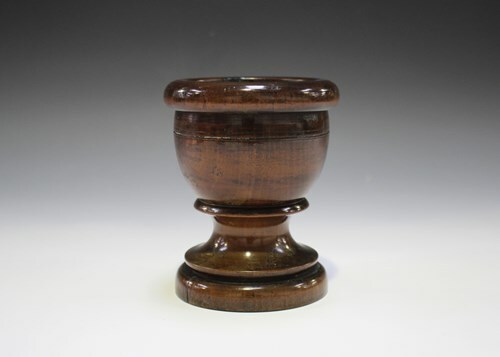 A 17th/18th century pole lathe turned beech covered vessel, the domed lid with knop finial above a ring turned body and a waisted stem with stepped foot, height 16.5cm. Provenance: Toovey's, The Polly de Courcy-Ireland Treen Collection, 20th September 2006, Lot 558. 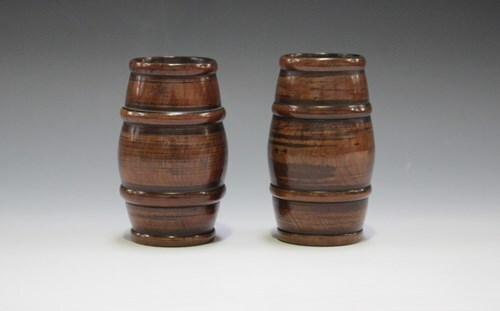 A pair of 18th/19th century English pole lathe turned yew spill vases of quadruple ring banded barrel form, height 10cm. Provenance: Toovey's, The Polly de Courcy-Ireland Treen Collection, 20th September 2006, Lot 602. 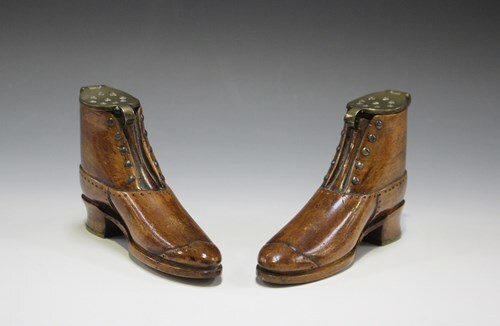 A pair of late 19th/early 20th century carved beech novelty models of boots, both fitted with hinged and pierced brass lids and with applied studwork, length 14cm. 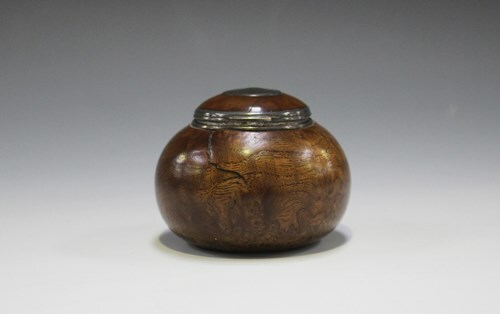 A late 18th century burr elm circular snuff box, the white metal mounted coquilla nut hinged lid applied with a white metal boss, engraved with initials 'JL 4X', diameter 7cm. Provenance: Toovey's, The Polly de Courcy-Ireland Treen Collection, 20th September 2006, Lot 527. A 19th century carved coquilla nut novelty nutmeg grater in the form of an acorn, the screw-off cover revealing a removable metal grating plate, length 7.5cm. 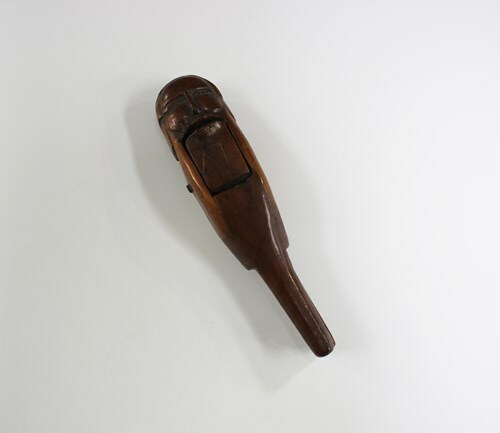 An 18th century carved yew nutcracker, the top modelled naively as a man's head and incised with initials 'A.T', length 13cm. 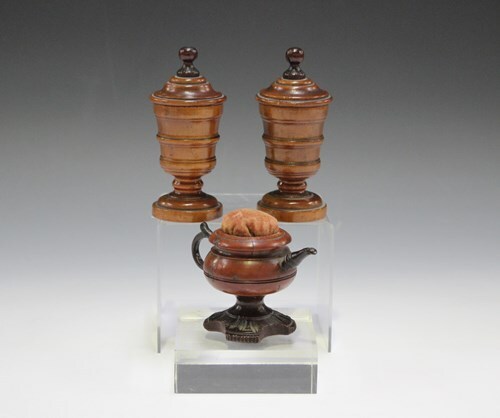 A 19th century turned coquilla nut novelty pin cushion, modelled in the form of a teapot, height 6.5cm, together with a pair of turned beech jars and covers, height 9.5cm. 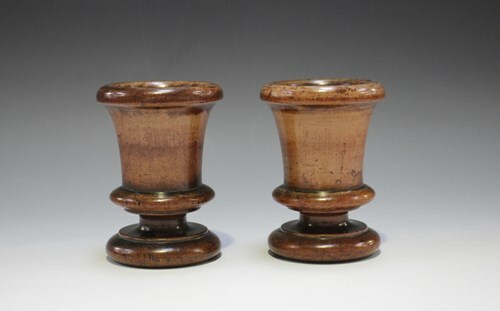 A pair of 19th century stained birch turned goblets, the waisted bodies above wide turned bases and stepped feet, height 11cm. 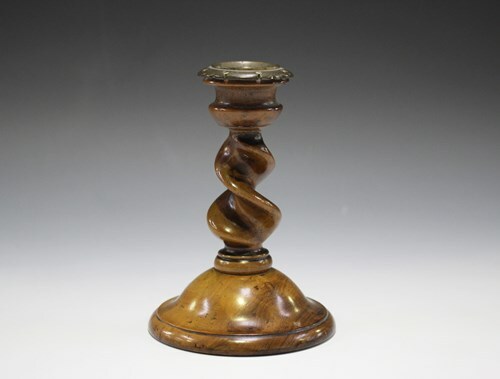 An 18th/19th century olivewood candlestick with a brass sconce and barley twist stem, raised on a domed screw-off base, height 12.5cm. 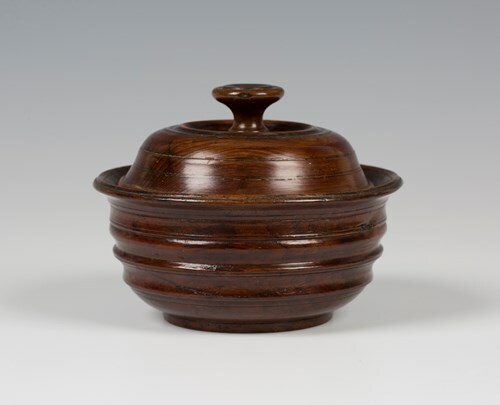 An 18th century turned fruitwood vessel, possibly a master salt, the circular body raised on a flared foot, height 10.3cm, diameter 10cm. 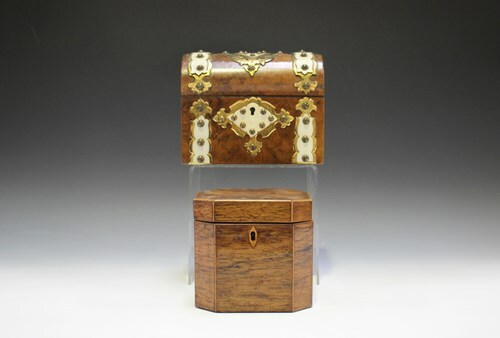 A George III mahogany tea caddy with boxwood stringing, width 13cm, together with a Victorian burr walnut and brass mounted tea caddy, width 18cm. 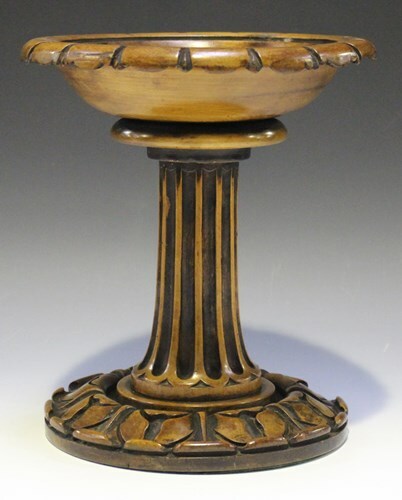 An early Victorian satin birch tazza, the top with a petal carved edge above a fluted stem and circular base, height 25.5cm.